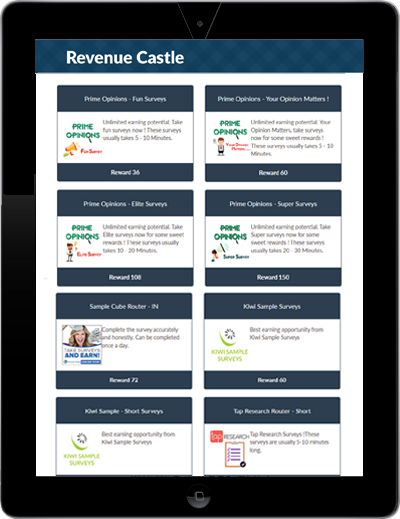 Revenue Castle is a leading Global Performance Marketing and CPA Network. Boost your earnings from your web and mobile traffic with Industry's highest paying and top converting offers. Revenue Castle provides our affiliates the highest rates than our competitors. We are extremely confident that you will earn more than others. We provide various verticals such as CPA, CPL, PTC, Mobile, Slideshows, Videos and many other verticals to choose from. Integrating our network on yours is simple & quick. Just follow the steps on our Integration page and That's It ! Monetize your App or Website with our offerwall and earn from your traffic. Setting up our offerwall on your platform is extremely easy. We have provided API and Integration tutorial for each platform in our panel. We have over thousands of active offers for your users in our system. All offers are categorised so that your users can complete offers of their choice. View detailed and accurate analytics of traffic in our powerful tracking platform. Our offers are direct and we are always dedicated to pay the Highest. Our payments are always on time and every Publisher is paid out on a NET basis depending on earnings. With a quality traffic and earnings Publishers can even get a chance to get paid on Bi-Weekly or Weekly basis. Revenue Castle provides it's publishers first class support. You can reach to us by e-mail or skype at any time and any day, and your queries or concerns will be sorted out by our experienced team as quickly as possible. Your information is completely safe & confidential. We know that privacy is an important issue, so we operate with the protection of your privacy in mind and help in growing your affiliate business.